Surely many of our readers remember (or have heard of) the famous spiritual/counterculture literary classic, Be Here Now, by Ram Dass (formerly known as Dr. Richard Alpert). Published in 1971 by Three Rivers Press, it turned people all over the world on to a world of Indian mystics and meditation, chanting, bhakti and other yogas, and many other things. Ram Dass has remained a very important spiritual figure and a mentor to people of all ages, all over the globe. His work with the issues of death and conscious dying alone has had a significant effect on what's come to be known as the Hospice movement. Be Here Now told the story of how Ram Dass (or, Richard Alpert, actually) met his guru, Neem Karoli Baba. When Ram Dass came back to the States in the early 70s, he began talking about his experiences and possibilities for human consciousness wherever he went, but first at his father's house in New Hampshire. One of the first pilgrims to follow his footsteps back to the guru was a fellow named Jeff Kagel, later called Krishna Das. 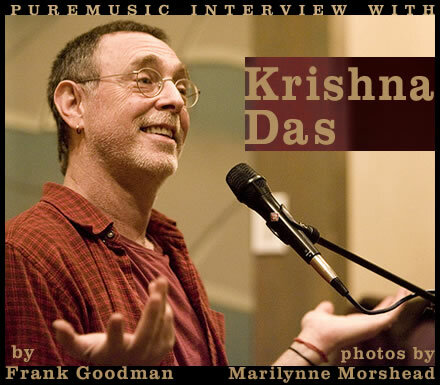 Fast forwarding to the present, Krishna Das has been back in the States for a couple of decades, and in recent years has been leading groups here and abroad in kirtan singing, or chanting. This is a spiritual movement on the one hand, and a musical one on the other. Many great musicians have aligned themselves with Krishna Das, live and in the studio. His personal charisma and presence is very powerful, both stimulating and centering. I was enlivened by his company in a NYC coffee shop rendezvous a couple of months back, and finally got around to interviewing him for Puremusic. Like the unpredictable rise and rejuvenation of the many forms of yoga in recent years (it's everywhere now), there is a growing number of people flocking to the kirtan scene. I happened to brush up against it myself because my brother Billy, an accomplished singer songwriter and slide guitarist extraordinaire (www.billygoodman.com) who resides in Germany, told me on the phone that he'd been doing a number of gigs with Krishna Das. So I checked out some records and found the music and the community fascinating, and was very lucky to meet KD while we were all in New York. We predict that when you check out the clips on the Listen page, that a surprising number of readers may find an unexplainable connection to the music, and go check out a live kirtan session for themselves. On most all the clips he is playing harmonium and accompanied by the exemplary Ty Burhoe on tabla, perhaps the finest student of the great Zakir Hussain. We also encourage you to visit the website of our friend KD (www.krishnadas.com) to find out more about this compelling spiritual person and rare singer of sacred music. 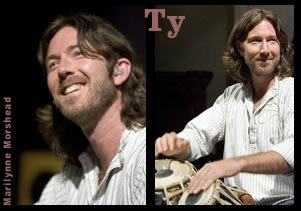 There you can also find out how to book him to come sing at your Yoga Center or spiritual gathering. When you consider all the terrible and crazy things going on in this world of ours, activity like this seems like a mighty good thing, and we recommend it highly.